Rodeo Drive Condos is a new condo development by Lanterra Developments. 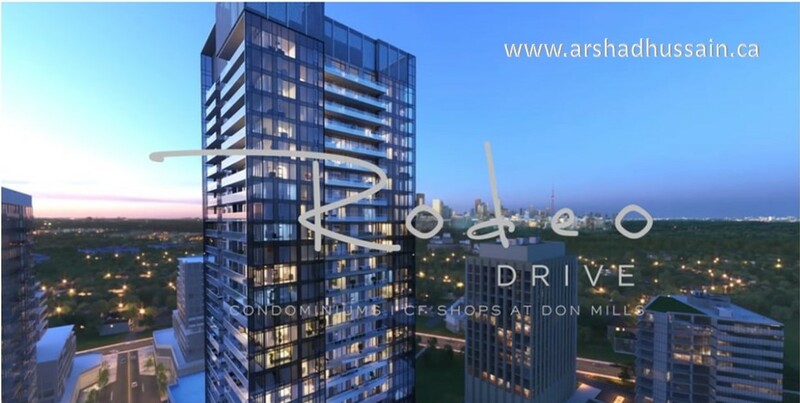 Rodeo Drive Condos is located at O'Neill Rd, Toronto, ON. Rodeo Drive Condos stands 31 storeys tall. Prices, incentives, figures, specification may change anytime with out any further notice and the units availability subject to the availability and based on first come first serve basis. If you need any help and want to discuss more about the project, unit choice and have other project related questions, please don't hesitate to contact me by email: arshadhussain29@gmail.com or you can call me direct: 647-519-5751. Sunnybrook Park, Wilket Creek Park, Moccasin Trail Park and Edwards Garden. Ontario Science Centre is minutes away as well as the Flemington Park Golf Club and the Donalda Club. Schools: Greenland Public School, Don Mills Collegiate Institute, Don Mills Middle School, Norman Ingram Public School and the Rippleton Public School. We certainly understand that, the decision to purchase a pre-construction condo requires careful consideration. We look forward to providing you with the information needed to make an educated decision. We are here to answer your questions and assist you in selecting the right unit that will fit your lifestyle. I must tell you when you are buying a pre-construction property there is a lot to learn and with us you will be more protected then going directly to the builder's office. As well, our best in class services start from the day you sign your contract until final closing. With our years of pre-construction knowledge and experience we will help you to select the best unit according to your needs and investment objectives. Arshad Hussain makes every effort to ensure accurate information, however, Arshad Hussain is not liable for the use or misuse of the site's information. The information on the Rodeo Drive Condo is neither intended to be nor does it take the place of legal, investment or real estate advice and users are strongly recommended to obtain independent legal, investment or real estate advice. The information displayed on The Rodeo Drive Condo is for reference only. I am a independent Realtor with World Class Realty Point, Brokerage in Toronto. I specialize in pre-construction sales. We do not represent the developer. We represent you. If you are currently working with a realtor, please advise and i will remove your profile from my database, as this service is not intended to interfere and/or solicit buyers represented by another realtor. The Ravine on York Mills - With 3 YEAR RENTAL GUARANTEE PROGRAM !! !